Welcome to Needle and Thread Thursday, y'all! 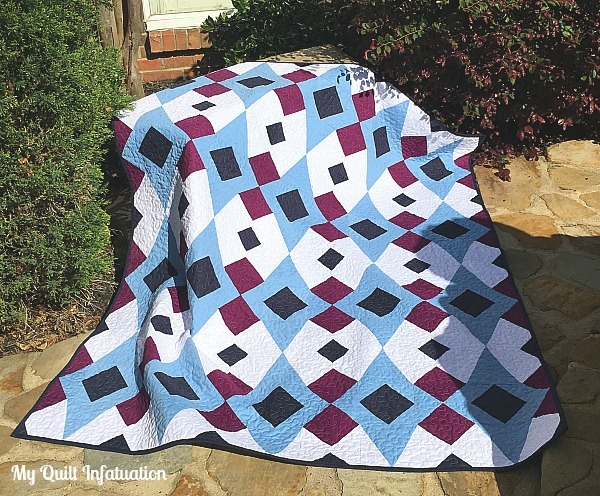 Sometimes I sketch new patterns and it takes awhile for me to get around to actually turning them into quilts, and other times, I design it and start creating it immediately. Such is the case with this newest one. 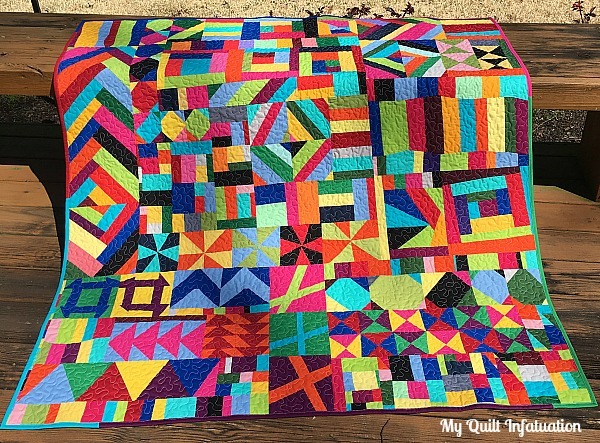 I was so excited to see this quilt come together, that the process from idea, to sketch, to quilt top only took about a week. It seems that I'm on a bit of a solids kick lately, doesn't it? I almost made this one with prints, but I wanted the lines of the pattern to really show. I love the diamond shape, as well as the secondary faceted jewel shape in the negative space and I was afraid that the secondary pattern would be less prominent with prints. 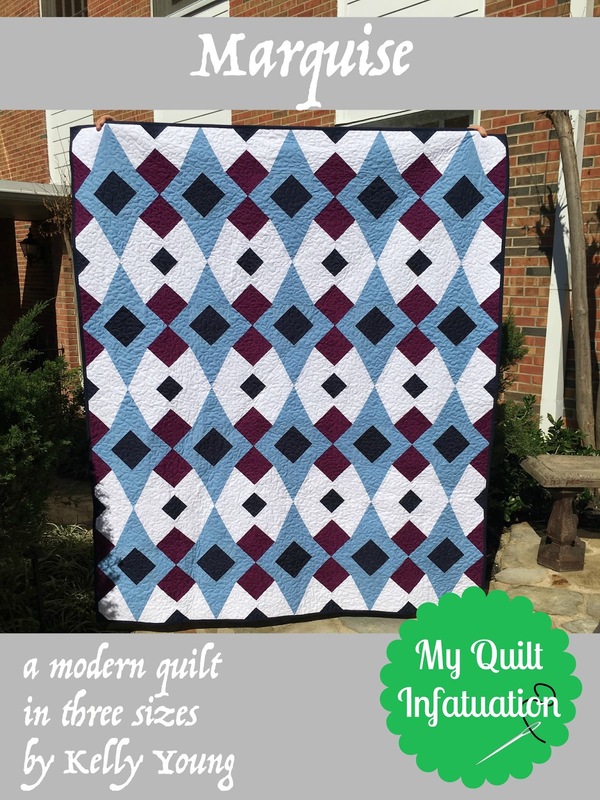 I know this one would really benefit from some creative quilting designs (especially because of the solids), but I have to level with you. I'm so engrossed in working on my book these days that it will probably get an allover stipple. Though I have branched out in my quilting lately, stippling is still my favorite, hands down. 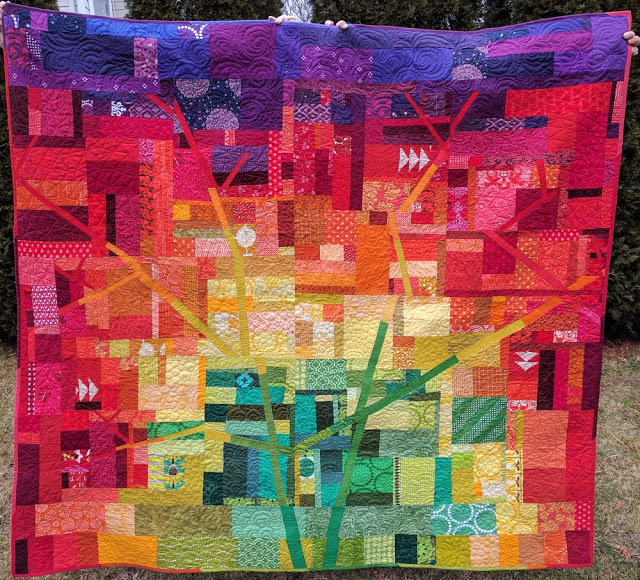 It is relaxing for me, and I also love how it looks on a quilt. I'll be finishing this one up between writing and editing sessions! 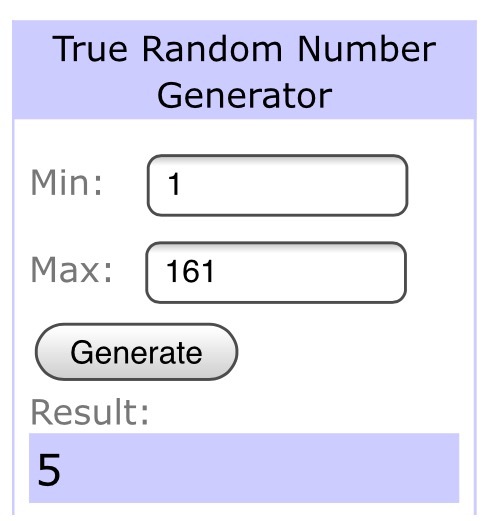 So, I owe you three winners from last week's sponsor news post. Just in case it's not obvious, I have the best sponsors around, and I love working with them! The winner of the gorgeous spring bundle from LouLou's Fabric Shop is comment number 113, Ann! 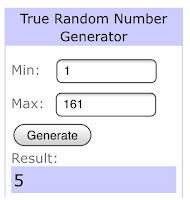 The winner of the $50 gift certificate to Fat Quarter Shop is Carole, comment number 5! And finally, the winner of the happy, vibrant bundle from Fort Worth Fabric Studio is comment number 10, STH. Congratulations, ladies! 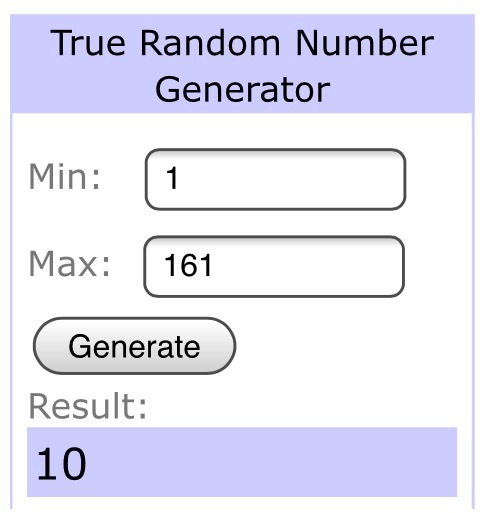 Have fun with your prizes! 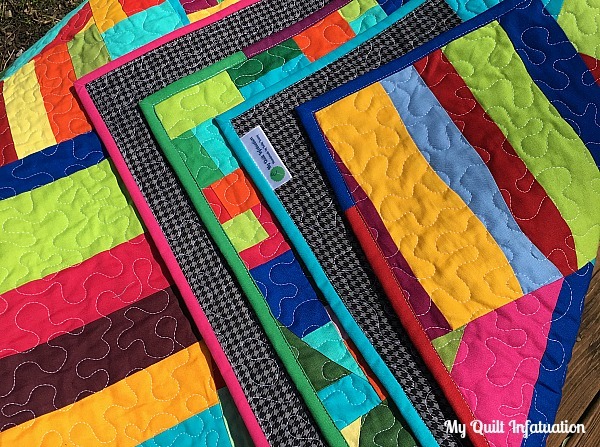 Tanya Quilts in CO linked up this pretty rainbow bubble quilt. 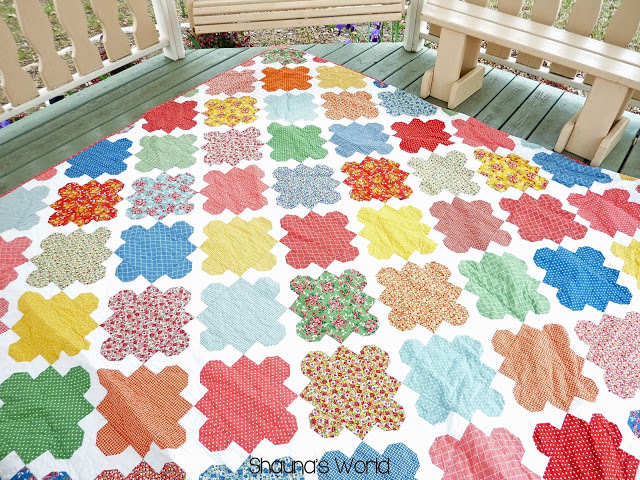 and Shauna's World shared her *king size! 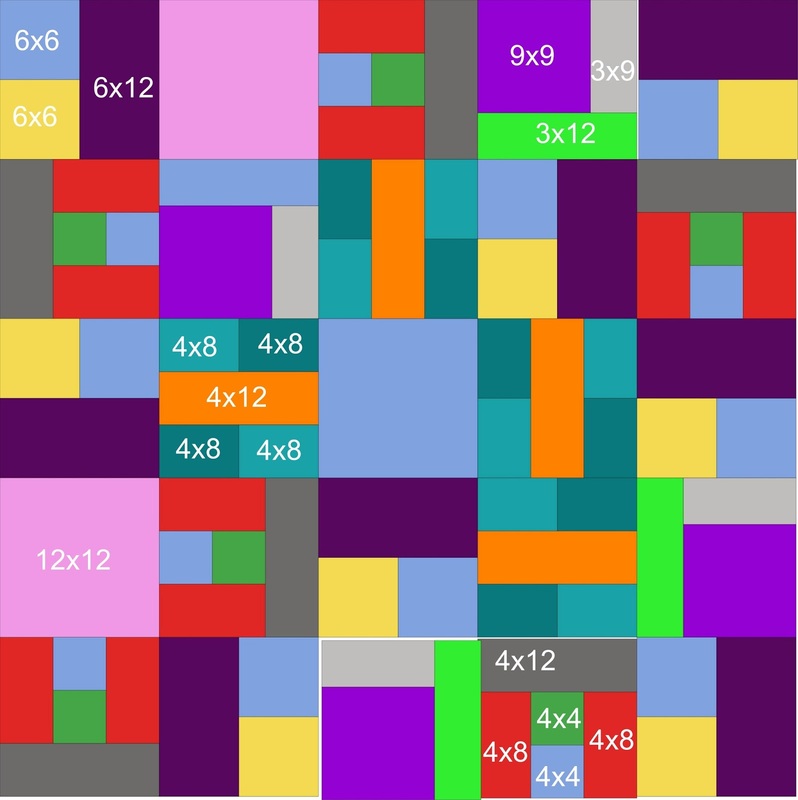 * version of my Courtyard Tiles pattern. It's a beauty! Wow, wow, WOW! Y'all are just amazing. 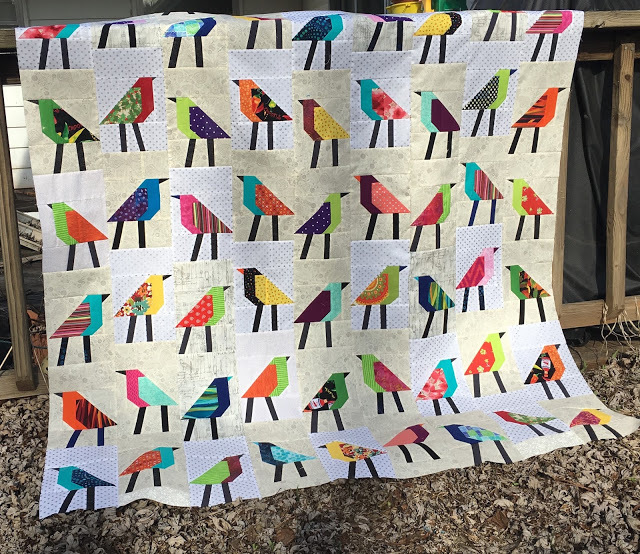 It is truly one of the highlights of my week to get to browse through all of the fantastic projects you have going on, especially right now, when I'm not getting to sew as much as I would like. (not that I don't love working on my book!) So let's party, friends! It is so bright and graphic, and just FUN! 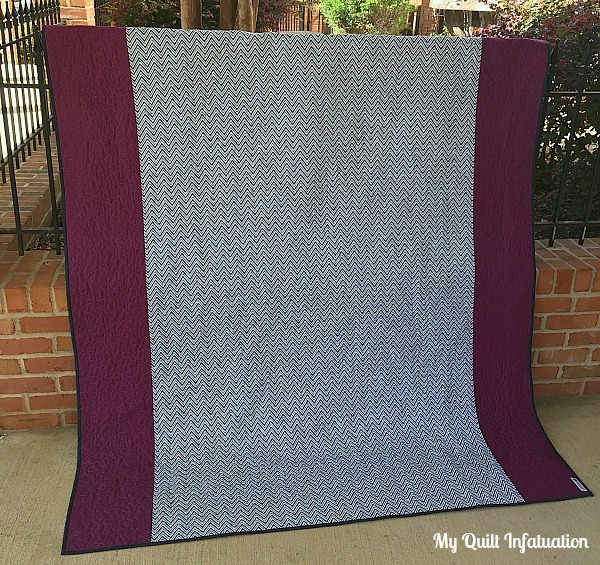 With all of the color and pattern going on, it looks like a big party, so I decided to call it Revelry. 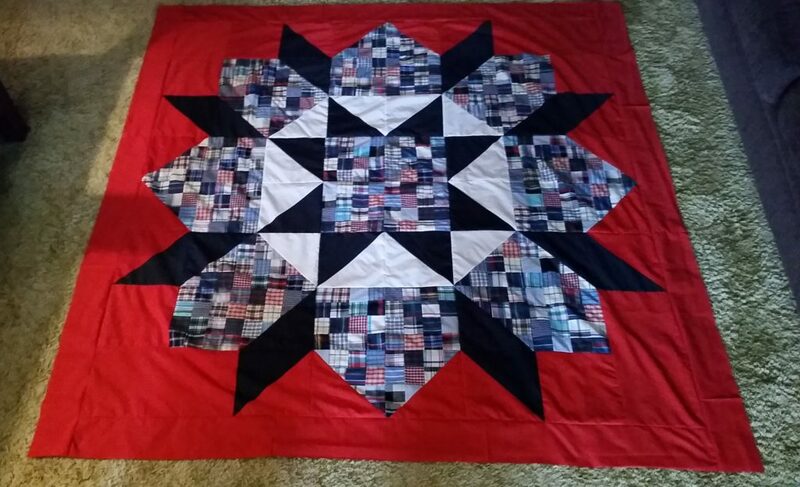 I really struggled with how to quilt this one. 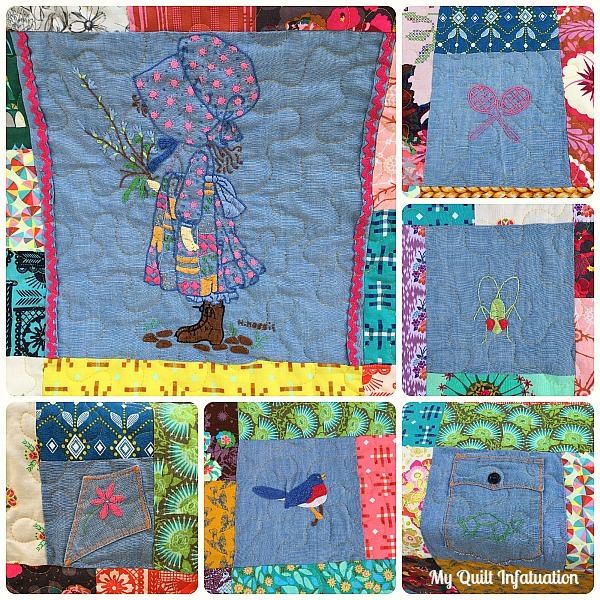 It is super busy, and I didn't want the quilting to compete with the patterns in the quilt. That being said, I felt that straight lines or a simple stipple were the best options for this one, and let's face it- I find straight lines to be so tedious and love stippling, so that settled it! 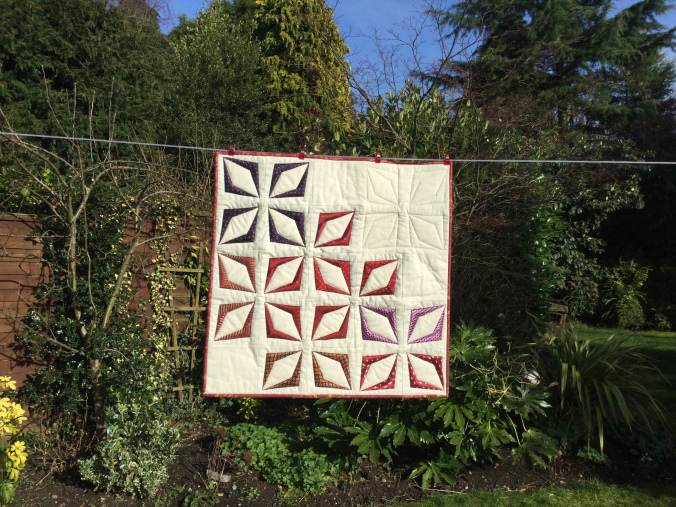 I'm pleased with the way the quilting disappears and lets the piecing madness really stand out. 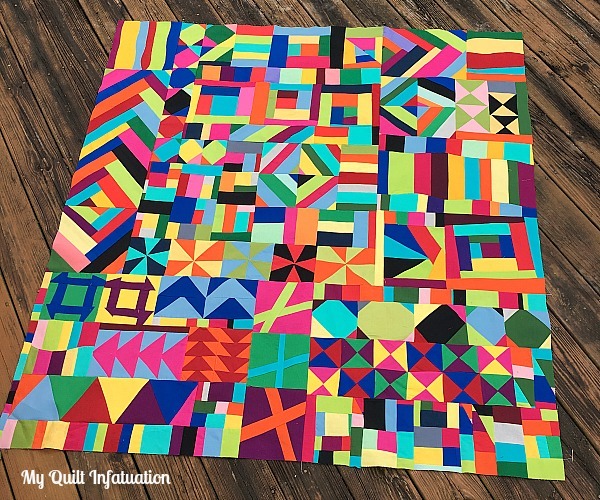 This quilt was fun from start to finish, and really opened my eyes to a different side of improv. 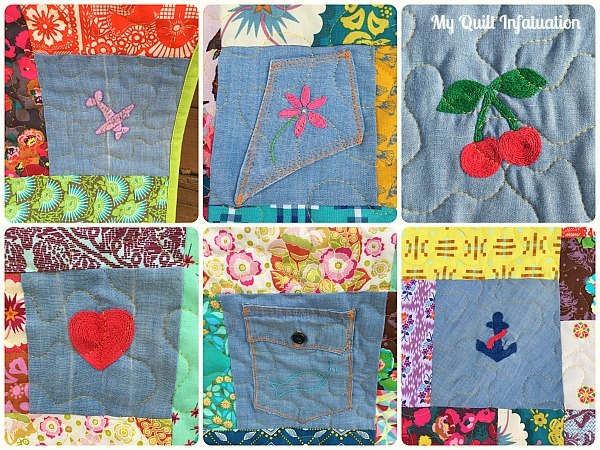 Though I have improv pieced lots of quilts, I have never sewn specific blocks improv-style. I incorporated churn dashes, braids, pinwheels, hourglasses, flying geese, crosses, log cabins, snowballs, strings, and triangles, and filled in space with strip sets and crazy improv- all without the use of a rotary cutter or ruler (though I did use them with the equilateral triangles and improv curves). 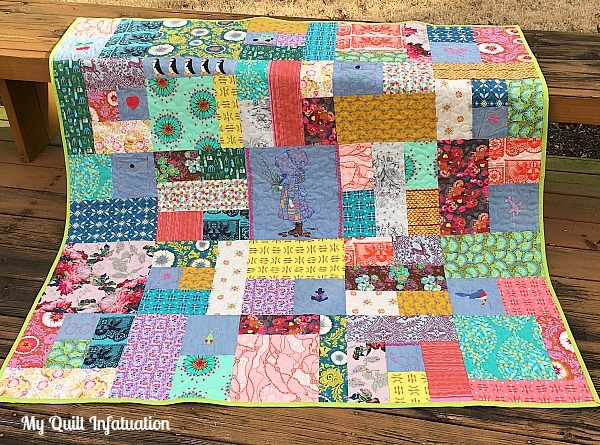 It kept things interesting to grab a few scraps, make a few blocks, and then move onto something else, never worrying whether the block was a certain size, or whether my points were perfect, etc. 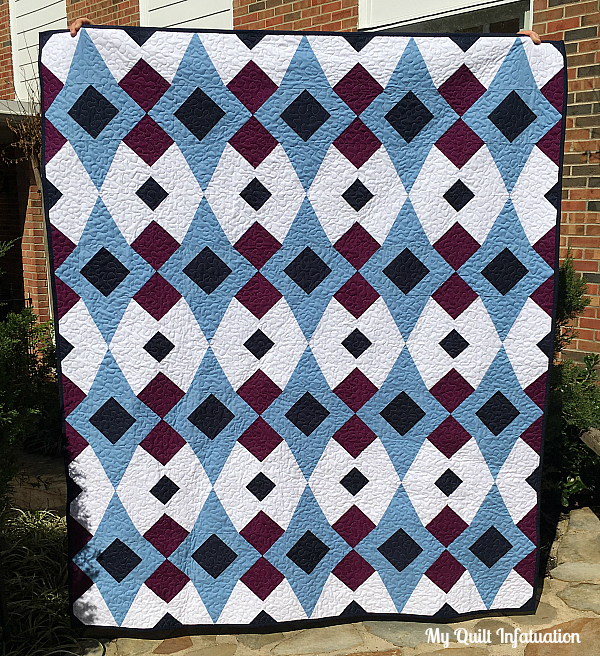 On the back, I used a small, gray and black houndstooth print, which really makes those colors pop; and I added a strip of Kona Breakers for interest. 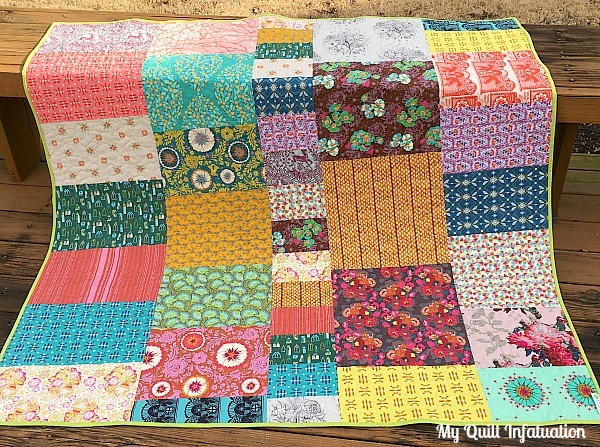 Scrappy solids make a perfect binding, and I love how it just almost disappears when looking at the quilt. 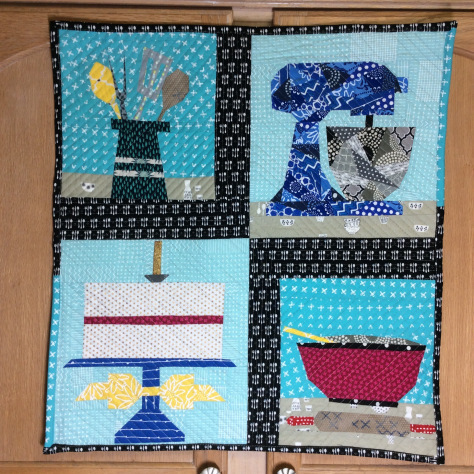 Sometimes I like for the binding to frame the quilt, but in this case, I didn't want to contain the crazy at all. 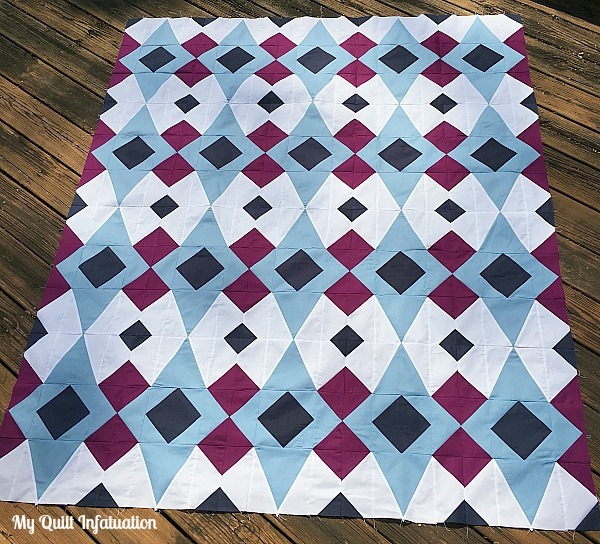 It took awhile to build up enough solid scraps to make this quilt, but this has definitely prompted me to play exclusively with solids more often! 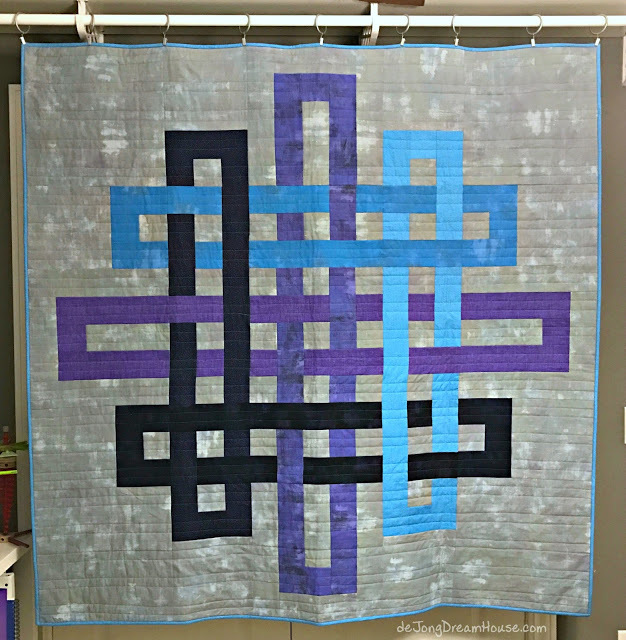 and this Intertwined quilt from deJong Dream House is fantastic! Wow! such lovely projects going on, and I wish I could have included several more. Whether you're enjoying some snow, fresh spring weather, or something in between, I hope you've got lots going on in your sewing space this week. Time to link up! Happy mid-March, y'all! 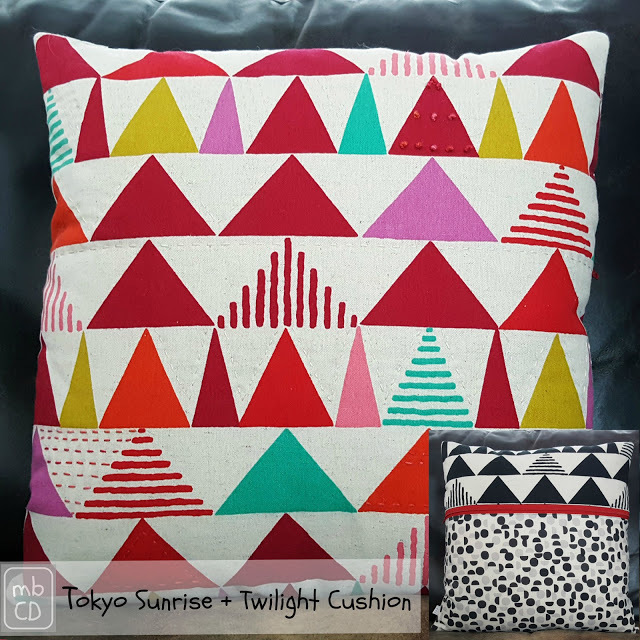 It's time for another post filled with the latest news from my favorite fabric shops around the web. 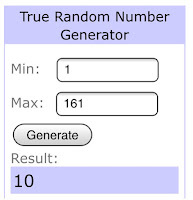 Oh, and this post includes three giveaways, so read on! 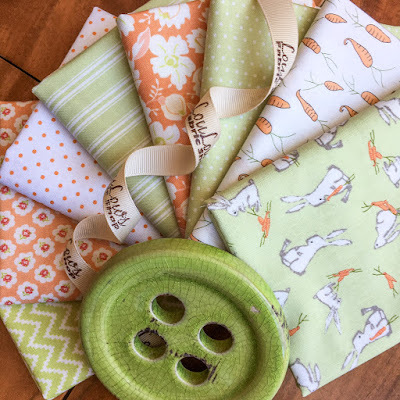 LouLou's Fabric Shop is ringing in spring in a big way! Just look at this sweet bundle! 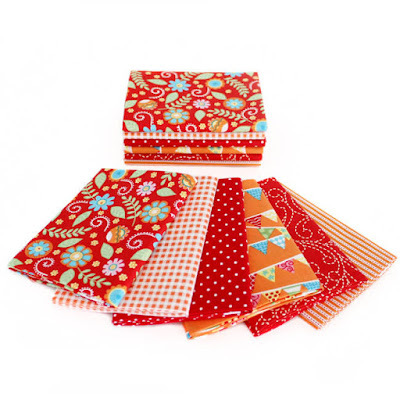 In fact, every week, LouLou's mixes a brand new bundle of 8 expertly curated fat quarters. Last week's bundle was so popular, they decided to restock it! Hop on over to check out the latest! LouLou's is sponsoring the first giveaway of the day, and kindly offering one of these fresh bundles to a lucky reader. Woo hoo! Speaking of bundles, Lady Belle Fabric is up next, and they are continuing their bundle blowout sale! Tons of bundles at 20%, 30%, and even 40% off. You definitely don't want to miss out on this, friends! 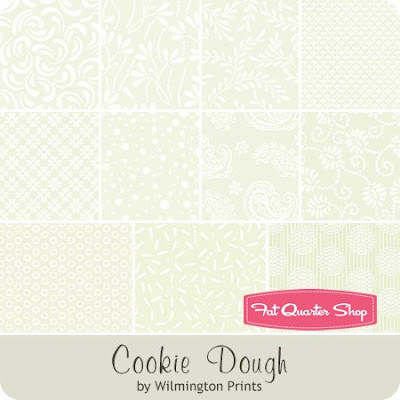 Fat Quarter Shop always has lots going on as well! 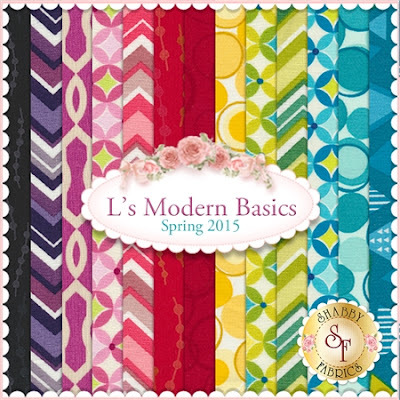 Did you know that every single month, they choose a basic, a notion, a book, and a pattern, and for the entire month, they offer 20% off? I particularly keep my eye out for the basic each month, and take the opportunity to stock up. This month's basic is the Cookie Dough collection. These are all white on white prints, great for adding some texture to your projects. Fat Quarter Shop is also sponsoring the next giveaway of the day- a $50 gift certificate for you to spend as your heart desires. Awesome! 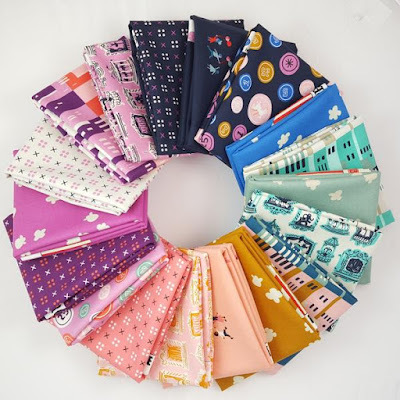 At Shabby Fabrics, the selection of beautiful fabrics seems endless, and their sale section is easily searchable alphabetically by the name of the collection. 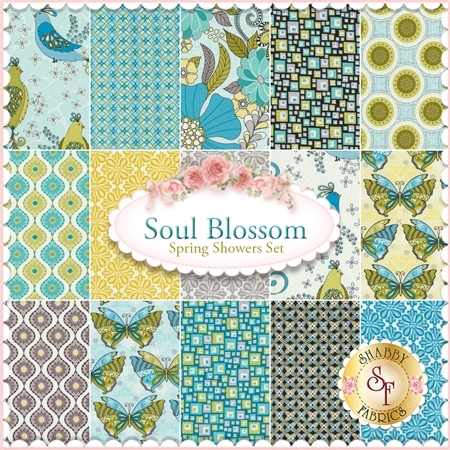 A couple of my favorites are the Soul Blossom collection, as well as L's Modern Basics. So much gorgeous color! 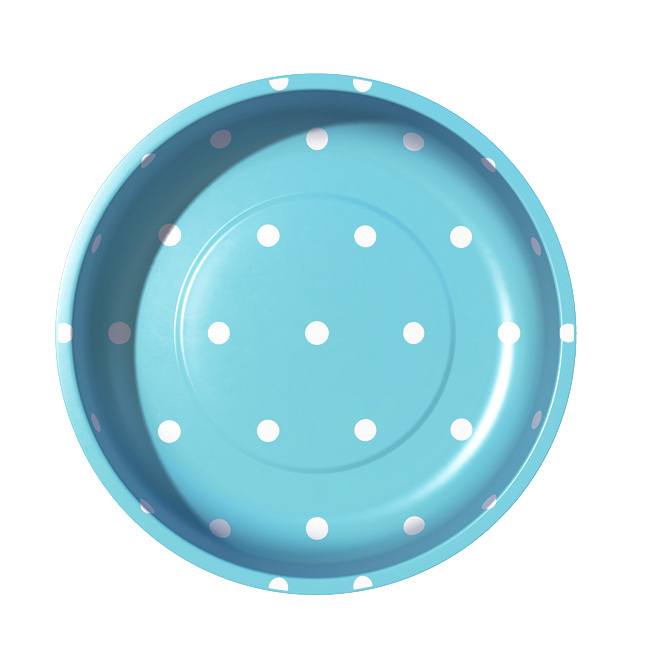 One other little highlight that I just can't help but feature are these adorable stainless steel, magnetic pin bowls. They are available in several fun colors, and they sell out quickly, do don't delay! Don't worry though, if your fave color is sold out, Fort Worth Fabric Studio assures me that they have lots more on the way, and they are even taking preorders for them. Wow! I know you're all blown away by all of the fantastic goodies and giveaways, and I know you all want to know how to enter. Just leave a single comment on this post to enter all three giveaways, and since one of our giveaways is open to the continental US only, please let me know if you are NOT in the States! Don't worry though, you're still eligible for the other three prizes. Remember to leave an email address if you're a no-reply blogger, and only one entry per person please! Unfortunately, replies to your own comment counts as an entry (the system numbers those, too), so remember to put your email address in your comment. Additional replies/comments/entries are always deleted. I'll announce the winners at NEXT week's NTT (March 22nd). 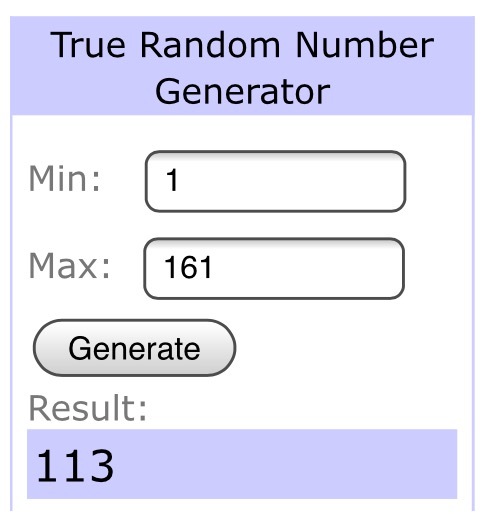 This giveaway has now ended! I'll announce the winners at this evening's NTT post. If you missed out, be sure to subscribe by email or using your favorite blog reader so you can be sure to enter next time. I have fantastic sponsors who offer amazing giveaways often! Happy Needle and Thread Thursday, y'all! 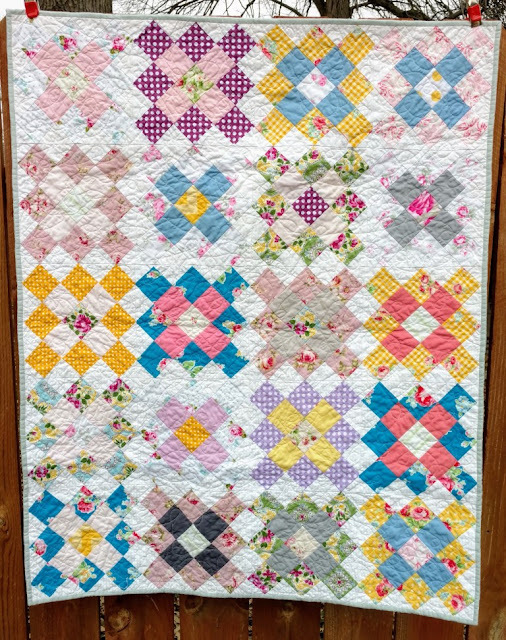 In continuing my scrap busting mission of late, I realized that though I have successfully used up my print scraps, I had SO many solid scraps that they deserved a quilt of their own. 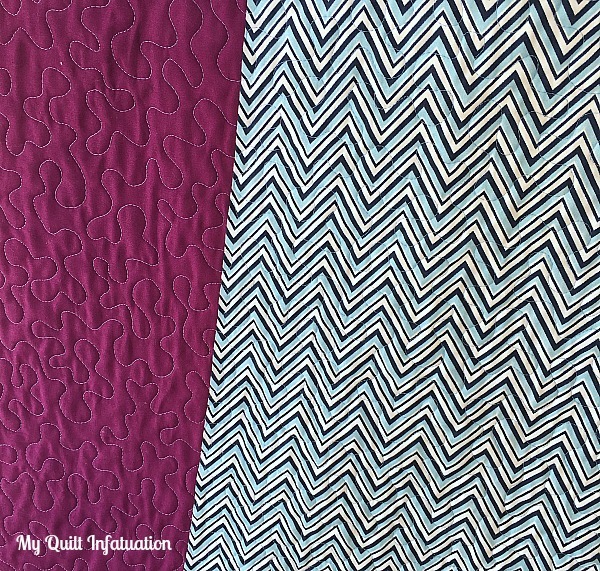 It's no secret that I don't usually make quilts using all solids, so this accumulation has been going on for awhile. I had lots of fun with this one. Since it has so many different elements, I sewed for two solid days and didn't get bored with it at all. 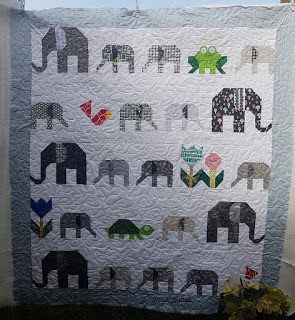 When I started, I had no plan for the quilt at all. 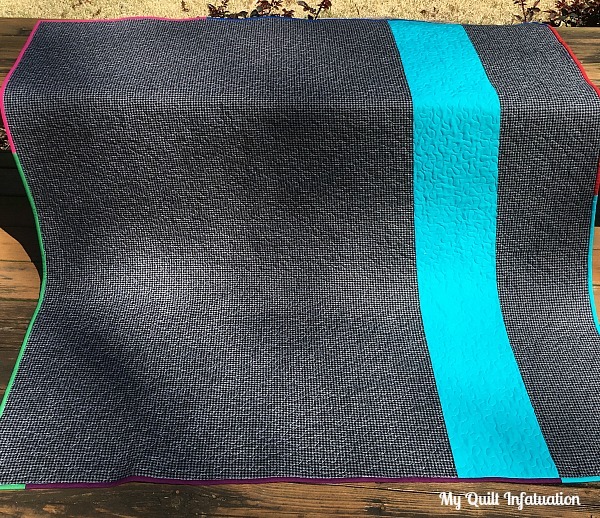 I started with the large braid, and started building the quilt from there. 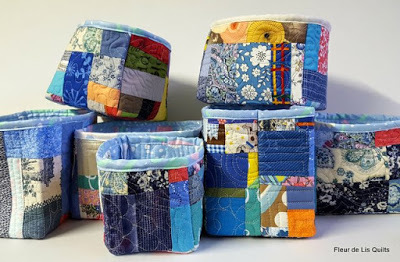 I used strips of small squares, strip sets, or improv blocks to fill in any places necessary. I started making a few of each kind of block, and filled the space little by little. 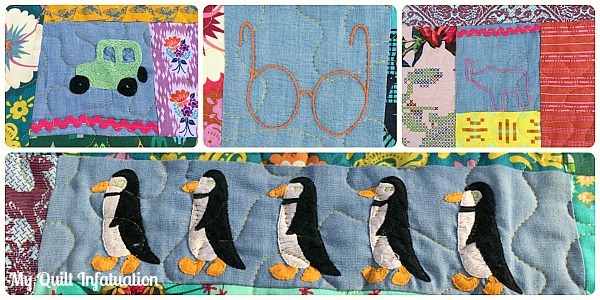 It was very free and fun, as I sewed without measuring anything. Each piece was made to fit with the existing chunk I was working with, and any extra was trimmed off. I didn't have to worry about keeping individual blocks perfectly square or preserving triangle points. The only thing I did worry about was making sure I sewed with correct seam allowance. 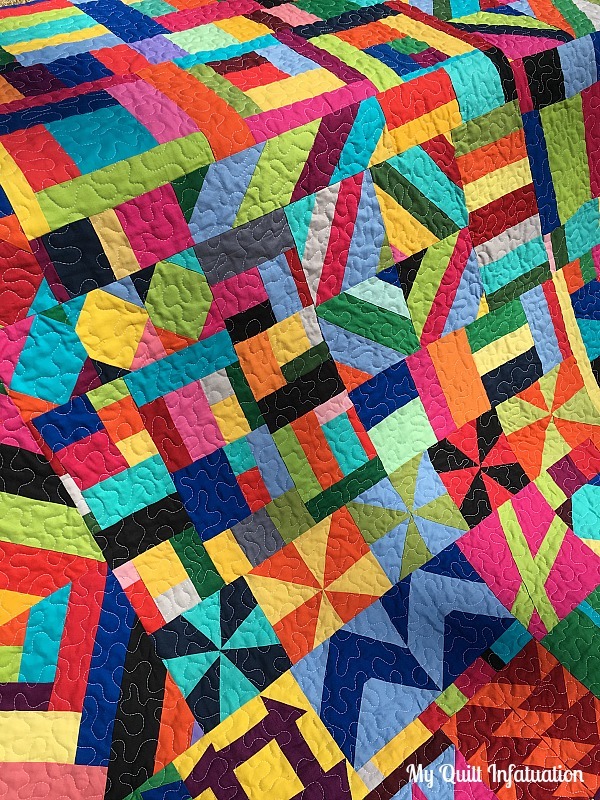 Though the quilt looks haphazard, its construction is sound. The Lilac Cat shared this awesome quilt. 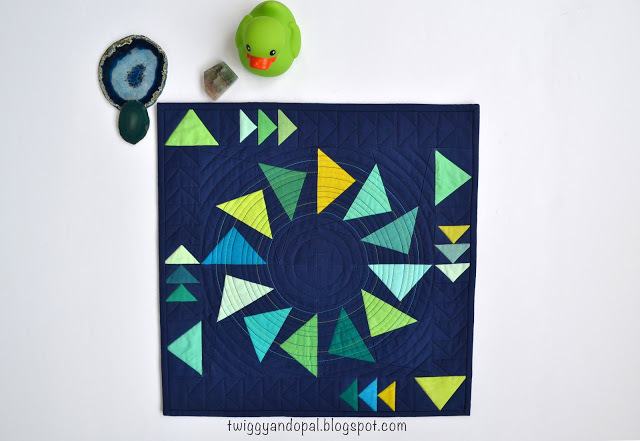 and check out this fun flying geese mini by Twiggy and Opal. Love! Y'all just rock! Let's see what you have going on this week!